Having done so many gardens in the past few years and often dug up my plants to move with me each time I have finally settled and am ready to put into practice what I have learnt and so the land based design for good. I moved to Old Hall in March 2015 and found unused land that I could grow my herbs in. First thing was to cover up the weeds and grow pumpkins on top to give me time to start in earnest in 2016. Vision is good. Paper design helps to get the thinking down, test ideas, share your vision and include others. Working with others means clear areas and labels vital. At the end of the day I am happy to change the design but thats fine as long as the design can be updated. Measure and draw the areas. Mark where shady areas are. Check when it rains which areas under the panels get water, Evaluate the year of growing in the soil (a little sandy) and prone to getting baked by the sun. Great shelter, lovely feeling to the area. 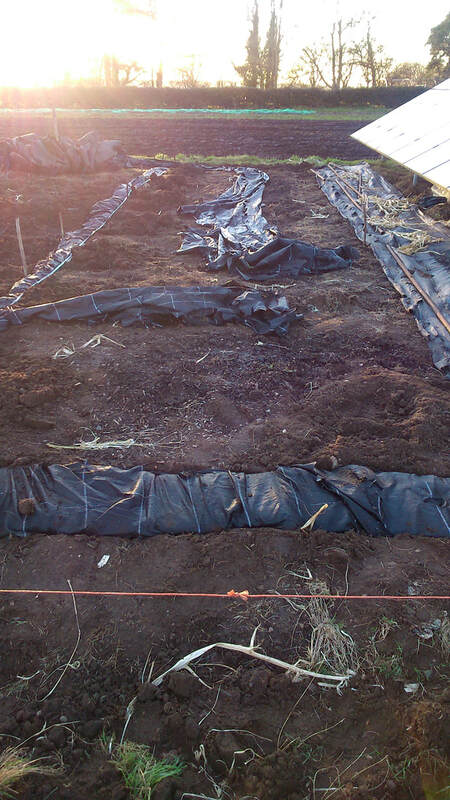 Mipex matting and old sheets of tat suppressed the weeds. Community glad to have the area looked after as it was an area that regularly got slashed to stop the solar panels getting shaded. There are 5 areas. I thought I would have one for culinary herbs, one for tea herbs, one for flowers and the rest for medicines. The area is however already being used for raspberries in one area. The rest has had weed matting of various efficiencies in place. It was the perfect place to grow on at Old hall for me. Bed 1) The culinary herbs were to be used most by the whole community so that was easy and would be the nearest to the house. Bed 2) Has the control panel and sweeky noise can from it so I was least interested in this. Bed 3) This was unused and pumpkins could therefore go here. Bed 4) felt furthest away from folk so I chose this for my herb collection of oddities. In each of these beds there were considerations of shade and sun. 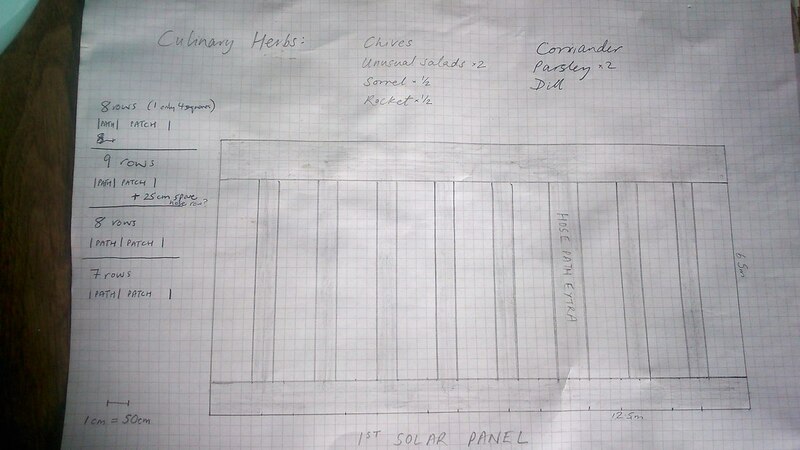 Height of plants so as not to over shaddow the solar panels and access to water etc. Stages: weed suppression, where help needed from WWOOFERS. By end of March I have nearly weeded (couch mainly that has mostly been killed off with weed matting) the first area. I created paths with the older dodgy weed matting so as to use it up and make manageable areas for each separate planting area. In my drawings I had 50cm paths which I reduced to 25cm. The plot sizes were changed by eye too due to finding four concrete blocks from an old wind turbine base which surprised me. I have been getting plants from friends and helping out places and getting their spare plants. This is easier that seed sowing as I don't have a seed germination area as yet. I also have bought plants from the plant centre where I work, as I can't help it. I cannot do it all on my own. I have got help by sharing the space with other residents and getting wwoofers to help me too. How much is harvested. Processed, Consumed or made into medicines. I found it hard to regularly maintain the areas but found the culinary patch got attention first. My special herbs were well mulched and even when it looked like a jungle it was easy to keep on track of. Many of the herbs for tincturing were not harvested due to not having the 96% barrel of alcohol in time for making tinctures with. Summer is busy and I lost some of the plants to weeds. 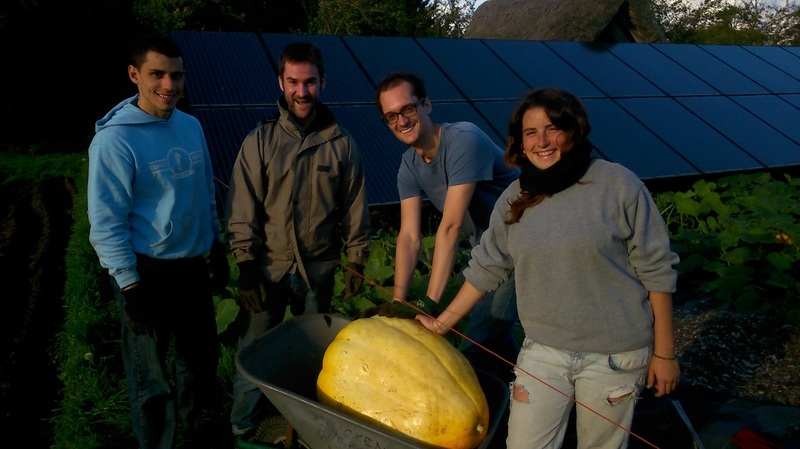 I have learnt that I am not alone at Old Hall and of the 5 areas between the solar panels, I have joined up with a fellow community member so he is looking after area 2 for pumpkins and beans. The fruit area has expanded in area 5 and I put blackcurrants in there too. So I am left with less space but that is more manageable and I will have longer term plans for separate tea, culinary, flower, medicinal areas. Mice/ rabbits/ foxes? Something has been digging. Something has also been nibbling. Mice/ rats have been under the weed suppressing mat. Rabbit hole have been found. I'm planning to sow seeds as of next week in April 2016. If this goes well it will be fantastic. Most were not successful e.g Chives but helping out at a project left me with a trug full of chive plants so once you know what you want it comes along. Label it well so people are confident to pick. trying metal tags July 2016 - failed on all fronts. Labelling a block for me. Partly due to huge diversity of plants. Partly due to division and gap filling, partly due to taking in new plants all the time and not have labels to hand. Partly due to not have a detailed plan other than an area to put new arrivals. 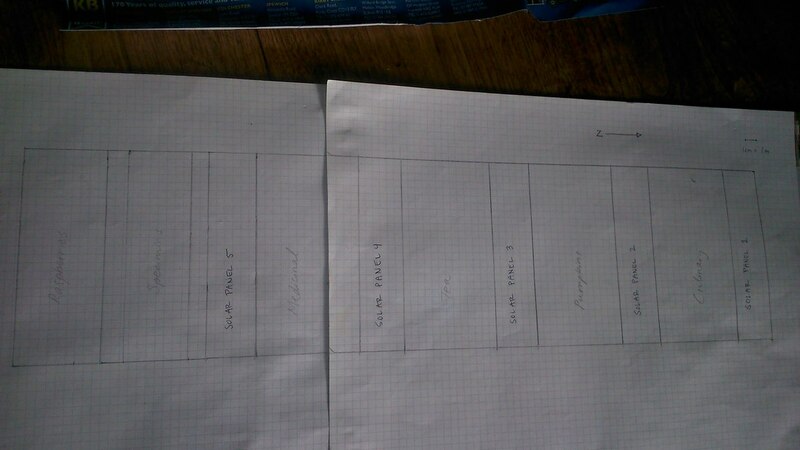 This will lead onto drawing skills, consultancy reporting and allow me a medicinal herb patch. As 2016 Autumn approaches after a hot summer I can think of moving plants. Area 1: performed well. Add new herbs to the patches. Area 2: pumpkins planted closely together worked well -by someone else. Ask them future use of space? Area 3: extensive pumpkins and no watering didnt work so well. harvest, then cover with carpets over winter. Area 4: filling up with plants - ensure labelled. My little patch of random herbs. Area 5: ready for expanding the fruit areas. Blackcurrant and more raspberries. Some poles and wire for raspberries. Digging up of Elecampanes and will use to tincture and replant. Shrub area developing here too.